The Gharial (pronunciation: /ˈɡɛːrɪəl//ˈɡarɪɑːl//ˌɡʌrɪˈɑːl/), also called the gavial or the fish-eating crocodile, is a species of crocodilian found mostly in India. Known for their exceptionally long snouts with a lump-like structure at the tip, they were previously found in almost all the major river systems of the Indian subcontinent. These reptiles have been declared critically endangered with their current distribution limited to only 2% of their previous range. Size: The average length of these creatures is between 11 and 15 feet (3.5 to 4.5 meters), however, can reach up to 20 feet (6 meters). Weight: On an average weigh about 350 pounds (160 kg), but the maximum recorded weight is 2,154 pounds (977 kg). Skin: The entire body – from the head to the tip of the strong, powerful tail – is covered with rough, thick skin like other crocodilian species, with small cellular patterns and three lines of small spiky protrusions running through the center of the body. Mouth/Snout: The jaws are incredibly long and narrow, and are firmly attached to the skull. Teeth: Both the jaws are lined with 110 sharp, interlocking teeth. Apart from being bigger by size, the male gharials have a lump-like structure at the tip of their snout, unlike the females. 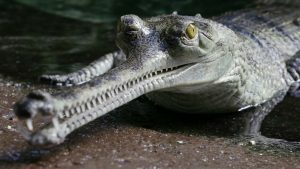 The exact lifespan of the gharial is still not known. It is thought that, like other crocodilian species, they live for around 50 to 60 years in the wild. These reptilians were once spread widely across India, Bhutan, Myanmar, Nepal, Pakistan, and Bangladesh. However, with a degrading population, they are presently scattered in several severely fragmented populations in parts of Northern Indian Subcontinent, while a small population is also in Nepal. Currently, no regional subspecies of the gharial has been described. Gharials prefer slow-flowing freshwater rivers with deep pools and large stocks of a variety of fishes. Gharials are primarily solitary creatures that are usually seen floating on the water surface or basking in the sun. However, unlike the other semiaquatic members of the crocodilian family that are even seen hunting on land, the gharials mostly remain in the water except while warming up their bodies on the ground or making their nests. During the mating season, the male gharials turn ferociously territorial, attacking other males that try entering their mating area. The gharials are unable to walk comfortably on the land which is evident from their weak legs. This feature also suggests that these reptiles need to drag their bodies onto the banks of the river. 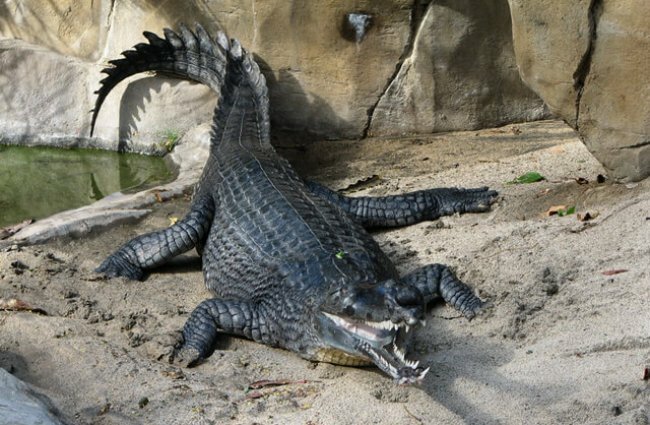 Like crocodiles, gharials need to depend on the surroundings to help their bodies keep warm since they are unable to regulate the temperature on their own. This is the reason as to why these animals need to bask in the sun from time to time. However, when they burn up the energy they gather by basking through hunting activities, they keep themselves submerged in the water to cool down. When in water, the gharials keep the entire body floating with just the nostrils and eyes exposed on the surface, while the tail and the hind feet act as brakes to resist them from completely sinking down. Young gharials eat small fish, frogs, tadpoles, and insects. Adults also feed on these, but also, larger fish and crustaceans. Gharials mate in the winter season while the baby gharials hatch before the onset of the monsoon. With the advent of the mating season, the male gharials implement some mating rituals. In order to attract and gather a harem of female gharials, the males would emit some vocalized sounds and use bubble displays they create by blowing up the bulbous bump right next to their snout. As the females gather together, the single male would begin mating with them in the water. 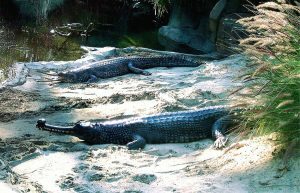 After a successful mating session, the female gharials would leave one by one, waiting for their gestation period to be over and lay their eggs, digging a nest. The nest is usually made at a reasonably safe distance from water so that the eggs do not wash away in case of a flood. A female would lay around 30 to 50 eggs between March and May. The eggs are hard and somewhat leathery, and weigh approximately 150 g each, with the incubation period being 2.5 to 3 months. 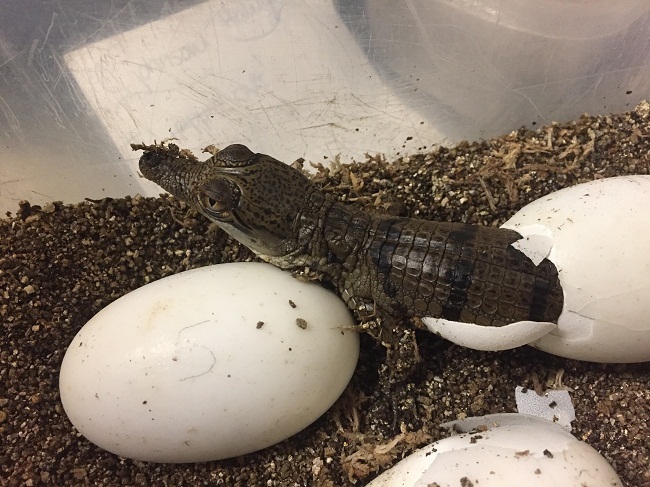 Before hatching and after the offspring come out, the mother gharials protect both the eggs and juveniles. However, unlike other species of crocodiles, they cannot carry the young ones in their mouths into the water, since they are unable to do so because of the shape of their snouts. The mother gharial provides food to the babies, while the newborn gharials, too, stay close to their mothers until they grow up large enough to protect themselves against enemies. 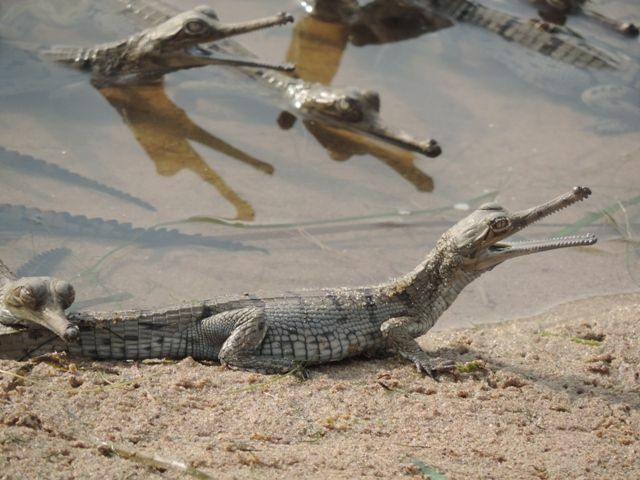 The young gharials acquire the age of reproductive maturity when they are approximately ten years of age. The male and the female baby gharials look alike since the males begin developing their lump-like structure at around ten years of age. 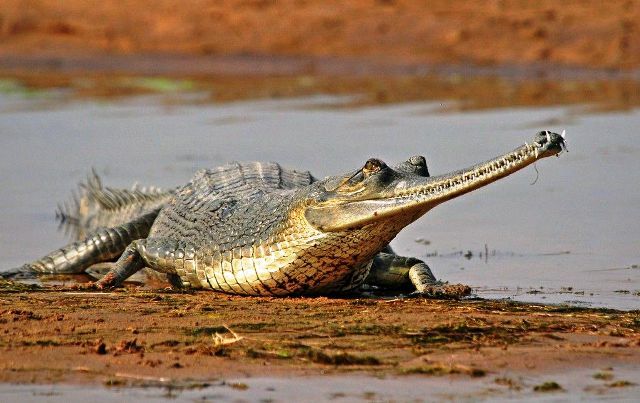 The elongated snout of the gavial has got adapted to its present form to make it easier for them to catch fish. These creatures use their webbed digits (toes) that are widely spread, allowing them to descend slowly into the water, so as to create less water pressure around itself, thus keeping them hidden as much as possible from the eyes of the predators. As a behavioral adaptation, the gharials have developed the inborn ability to herd fish against the shore and finally stunning them by snapping their jaws together, a tactic which is called ‘percussive stunning’. This makes their task of preying easier. The eyes and nose/nostrils of the creature are set high to help them keep these parts above the water surface for keeping an eye on its prey and predators, as well as for potential respiration. The excreting glands on the gharial’s tongue assist them in tolerating the saline (salty) water environments. As an anatomical adaptation, the creatures have a structure, called the tapetum lucidum, situated just behind each of their retinas, which helps them enhance their vision in the dark or low light. Unlike their other crocodilian counterparts, the gavials are not at all dangerous to humans, and are, in fact, shy in nature, hurriedly dashing out of sight (or take refuge into the water) when someone comes around. Also, the shape of the gharial’s snout is not fit for attacking or biting humans. Owing to their large size and semi-aquatic nature, the adult individuals have no natural predators within their habitats. However, the smaller or juvenile gharials are often attacked by birds of prey and more massive reptiles like a few species of snakes. 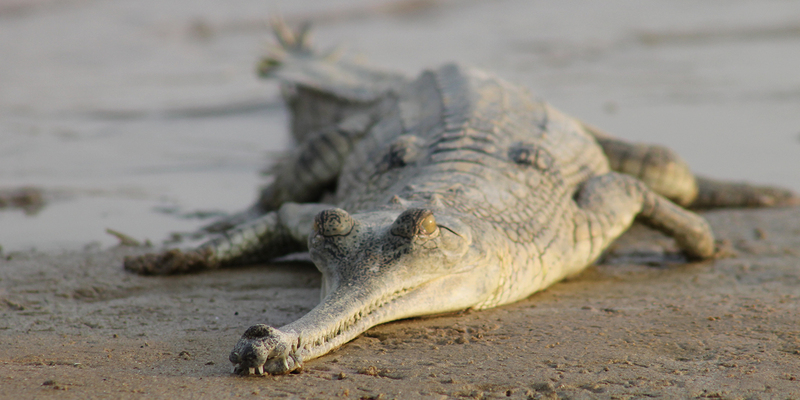 Since the 1930s, the population of the gharials has fallen drastically, and the IUCN 3.1 has categorized them as ‘CR’ (Critically Endangered) in their Red List. 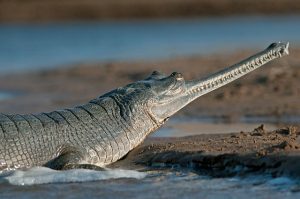 At present, the global gharial population in the wild is estimated to be less than 235 individuals (excluding the captive specimens in the wildlife sanctuaries and national parks). The term ‘gharial’ has come from the word gharA, which in several Indian languages translates to a kind of earthenware pot used to store water. The name has probably come from the large lump-like structure at the tip of their nostrils/snout that roughly resembles a ‘gharA’. This reptile is one of three crocodilian species that are native to India, with the other two being the saltwater crocodile and the mugger crocodile. Of all the crocodilian species in the world (including crocodiles and alligators), the gharials have the largest eggs. 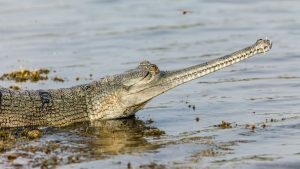 The generic name of the gharial Gavialis is based on a misspelling of the Indian word ‘ghariyal’, while the specific name gangeticus has come from the Indian River Ganges, where they were found in large numbers.